When a contractor needed to verify that there were no conduits in the concrete in the area where they wanted to core drill they called Ground Penetrating Radar Systems. GPRS marked the conduits directly onto the surface and since there is no radiation involved the occupied building didn’t need to be cleared of any workers. GPRS used ground penetrating radar for the concrete scanning to mark out the rebar. The GPRS Tech, Nate Kollar, was able to locate the reinforcing rebar and conduits. GPRS then marked them directly on the surface with black marker. 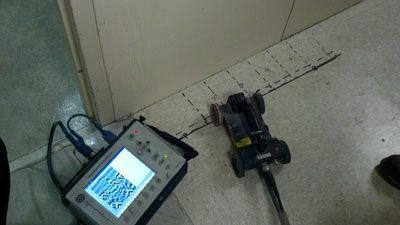 Since the results are immediate GPRS was able to complete the concrete scanning accurately and quickly. For projects in Cincinnati and surrounding areas, contact Nate Kollar (513) 225-3076 or by email at nate.kollar@gprsinc.com.